CUT, CHOP, SLICE & CARVE MEAT, FRUIT & VEGGIES with a high-end chopping knife making your daily or special dinner preparation a fast, easy, most enjoyable task. The 2.5mm German High Carbon Stainless Steel 7\" balanced blade is the perfect blend of FLEXIBILITY and HARDNESS to ensure long-lasting razor-sharp perfection and RUST-RESISTANT performance. Toss it in the dishwasher or wash it in hand with soapy water. EASY-GRIP, NON-SLIP ERGONOMIC HANDLE! The smart ABS handle of this professional butcher\'s cleaver knife will facilitate use, as it won\'t slip or slide off your hands. In the perfect weight for effortless cutting (280gr), this kitchen chopping knife will speed up cooking adding precision to your tasks and preventing cutting accidents. 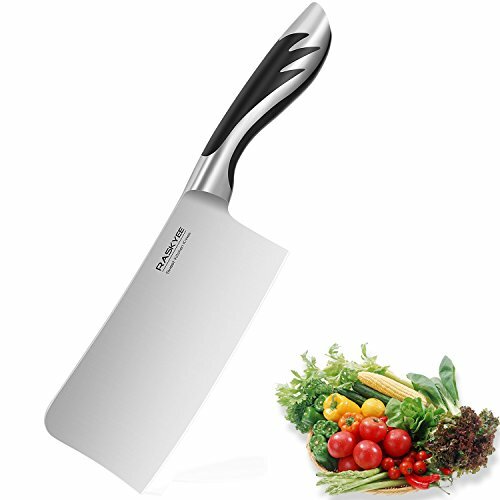 It is a user-friendly, easy cut kitchen chopping knife designed to make your life easier! A MULTIPURPOSE TOOL IN EVERY COOK\'S ARSENAL! Perfect for cutting, chopping, dicing, carving, mincing, and even bone removing, this balancing kitchen knife is the #1 meat chopping knife, vegetable cutting knife, turkey carving knife or fruit cleaver! It is a premium Staineless Steel professional knife, FDA-approved and absolutely safe for your health, a MUST-HAVE for expert or beginner cooking lovers! READY TO OFFER AS AN UNFORGETTABLE GIFT! Coming in a deluxe black velvet GIFT CASE packaging, this razor sharp kitchen knife makes the ultimate gifting idea to any loved home or professional chef! Offer it as a deluxe birthday, Christmas or housewarming gift and show off your excellent taste on all occasions! Put a wide smile on the face of any loved pro or beginner cook! YOUR COMPLETE SATISFACTION IS 100% GUARANTEED, as Raskyee professional knife in carrying case is backed with our unconditional 100% Money Back Guarantee and the warmest Customer Service, making your experience absolutely RISK-FREE! So, place your order in peace of mind, as you have nothing to lose. To us, YOUR satisfaction is top priority! Great knife, every kitchen should have one! The Same Quality as a Chef's !! I loveeeee this "hachuela", it reminds me of my grandmother's cooking.